The AY Live Another Invasion DVD is a100% Comedy, Music, Dance and Drama Performances by AY, Majid Michel, Nadia Buari, Yvonne Nelson, Omotola, Funke Akindele, Aki and Pawpaw, Seyi Law, Elenu, Princess, Helen Paul,Tonto Dike, Susan Peters, Tuface Idibia, 9ice, Kas, Olamide, YQ, Kaffy, DNMT, D'Prince, White Nigerian and Ay’s Open Mic winners. The premiere of the AY live show (on DVD) that sold out the 6,000 capacity hall of Eko Hotel and Suites will be hosted by IK (Big Brother) and Nollywood diva Omoni Oboli. The Night will also be honoring Governor Babatunde Raji Fashola (SAN) of Lagos State, Godswill Akpabio of Akwa Ibom, Dr. Emmanuel Uduaghan of Delta State, Dr. Olusegun Mimiko of Ondo State, Owelle Rochas Okorocha of Imo State, Rt. Hon. Rotimi Chibuike Amaechi of Rivers State, Globacom, MTN, Etisalat, Nigerian Breweries Plc, Peak and the King of Comedy Alibaba, for their contributions towards the growth of the Nigerian entertainment industry in general and the Nigerian comedy industry in particular. The event which is strictly by invitation is supported by Haven Homes, Hibuzz, Cool FM, Wazobia FM, Beat FM, Naija FM, HiTv, AfricaMagic, City People, Encomium, Silverbird Television, Hip On Tv, Dynamix on Tv, TV Continental, 911 Entertainment, Music Africa, 1 Music, LASAA, Media Crush, e-motion, Inspiration FM, Flytime Promotions, Arik Air, Plural Media, YES!, Bella Naija and Linda Ikeji. 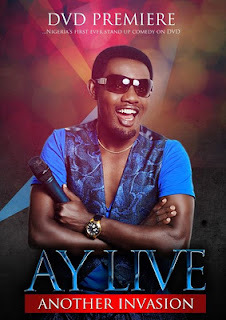 The AY Live Another Invasion Comedy DVD is powered by Corporate World Entertainment and Meelk Property Services Limited.